Casein is a high quality protein isolated from milk, and commonly described as “slow-digesting” because it is broken down more slowly than whey, egg, pea, or soy. The advantage of extended digestion time is hours-long delivery of amino acids – an attribute that is particularly advantageous throughout the night while you sleep. Built from a novel mix of native micellar casein, micellar casein, partially hydrolyzed casein, and alpha-lactalbumin, PROMASIL CASEIN is as timely as it is time-released. Stack it with PROMASIL or NATURALLY FLAVORED PROMASIL for around-the-clock protein coverage. 24 g slow-release protein blend. Distinctive NATIVE MICELLAR CASEIN formula. Up to 8 hour amino acid delivery. Alpha-lactalbumin and partially hydrolyzed casein. 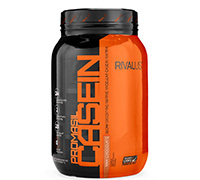 Add 1 scoop of PROMASIL™ CASEIN to a glass or shaker cup filled with 10-12 ounces of cold water. Shake or stir until powder is fully dissolved. Enjoy. Tip: Try blending PROMASIL CASEIN with milk, cashew, almond, or peanut butter, flaxseed oil, and/or oat bran. These foods contain high quality fats, protein, complex carbs, and fiber to help keep the amino party going a little a little longer. Bedtime. PROMASIL™ CASEIN also makes a great high protein snack in between meals.